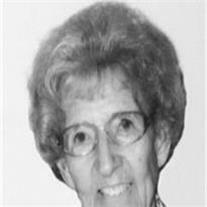 Mildred Cluff Kerby, 92, of Gilbert, AZ passed away Thursday, September 08, 2011. She was born April 5, 1919 in Gilbert, AZ to Vernon Howard and Pearl Allen Cluff. The family moved to Pima, AZ when she was three where she attended school and graduated from Eastern AZ College. She worked for Mountain Bell as a switchboard operator and lived in Tucson, AZ until 1946. On February 19, 1947 she married Jesse Ray Kerby in Pima, AZ. They moved to Hayden, AZ where two daughters were born. They transferred to Phoenix, AZ with the Southern Pacific Railroad in 1951 where three more daughters were born. Mildred served in many leadership capacities of the LDS church. She was an excellent teacher and a leader in both Ward and Stake positions in family history, Young Women, Primary, and Relief Society. Mildred was talented in many areas including having a beautiful alto singing voice, cake decorating, pianist, sewing, crochet, quilting, and gardening. She and Ray served a mission for the church in Kodiak, Alaska. They moved to Gilbert, AZ in 1981 and served as Mesa Temple workers. She loved to serve and touched many lives and was a great example of a Christ-like life. She was an amazing wife, mother, grandmother, and great-grandmother. She is survived by her husband of 64 years Jesse Ray Kerby, her five daughters, Barbara Ann Whitmer (John), Genevieve Kovacs (Tony), Shirley Rae Goodman (Benny), Lynette Stansbury (Jerry), and Debbie Jean Goodman (Randy), 30 grandchildren, 62 great-grandchildren, and siblings Cleora Colvin, Clea Beach (Roy), and Gale Cluff (Karen). Viewing will be Wed., September 14, 6-8 pm at Bunker’s Garden Chapel, 33 N. Centennial Way, Mesa, AZ. Funeral services will be held Thursday, September 15, 2011 at 10 AM at the Church of Jesus Christ of Latter-day Saints, Lindsay Ward Building, 1150 N. Lindsay Rd., Gilbert, AZ with visitation at 9AM. Interment will take place at Greenwood Memory Lawn Cemetery in Phoenix, AZ following the services. In lieu of flowers, the family requests donations made to the LDS missionary fund.